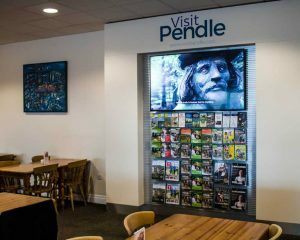 Pendle Leisure wanted to create a well-designed visitor information point, to be located in the Café area within retailer Boundary Mill’s flagship store outlet, based in Colne, Lancashire. Pendle Council sent out a tender document to a number of Audio Visual and Digital Signage Business across the Lancashire area. The shortlist created from this tender, resulted in a number of companies providing demonstrations of their products and services to the council. Dynamax Technical Services and their digital signage product “digitalsignage.NET,Core Edition” was chosen to drive the dynamic content mix of high impact videos and location based events and activities. Mike Williams, Tourism Officer for Pendle Council comments “ After a number of supplier site visits and demonstrations from various Digital Signage companies, we chose Dynamax. We did so because they offered us a simple, easy to use system, which was good value for money”.Dynamax has worked with a number of council offices across the UK providing high impact information screens for use in waiting rooms and cafe areas where a high footfall of people occurs. These displays are used to deliver targeted messaging to both visitors and council staff members. If you would like to know more about the installation at Boundary Mill Stores, Colne or any other areas of digital signage, then please get in touch. This entry was posted in and tagged advertising, digital signage, Pendle, retail digital signage, tourism by Dynamax. Bookmark the permalink.